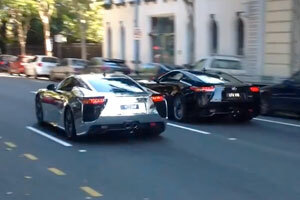 This video may be your only chance to see three Lexus LFAs, a McLaren MP4-12C, and an Aston Martin One-77 all together on the road — be sure to watch it in full HD. Maarten: That was Brisbane downtown. Andrew, Andrew, 6 or 12 points on the licence ? Anyway, Happy New Year for everybody.